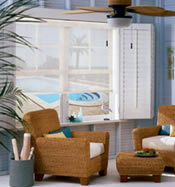 In sunny southern locations, protecting your windows from the sun is an important component of good window management. The first step is to know how the sun moves through the sky and to orient the building and place the windows in it so as to minimize direct solar admission through your windows. 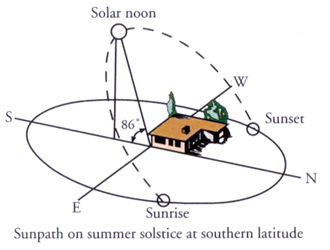 In the northern hemisphere summer the sun rises north of due east and sets north of due west, climbing rather high in the sky at solar noon on the summer solstice (about 21 June). The drawing below is for a mid-Florida latitude. The further north your building is the peak solar altitude angle will be less than the 86 degrees shown below. 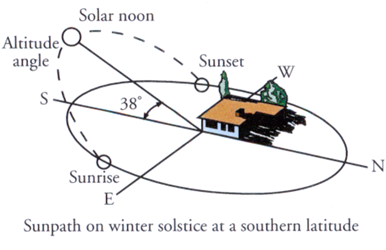 In the winter the sun rises south of due east and sets south of due west, climbing not very high in the sky at solar noon on the winter solstice (about 21 December). The further north you are above a mid-Florida latitude, the lower the midday winter sun will be. At other times in the year, the sun paths will be intermediate between these extremes. Only on the equinoxes (21 March and 21 September, approximately), will the sun rise due east and set due west. You can see from these illustrations that is is easy to protect south-facing windows with a roof overhang for all but the lowest winter sun. In climates with cool or cold winters, it might be desirable to allow some solar radiation into south-facing windows, so do not make your roof overhang too wide in such cases. 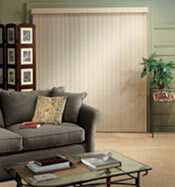 In hot climates, however, it might be best to make the overhang wide enough to block the midday winter sun year round. North-facing windows hardly need any shading, since the only time the sun impinges on them is early in the morning or late in the afternoon in summer, and at those times the angle of incidence is so great that much of the radiation is reflected from the glass or blocked by the walls on either side of the window, especially if the window is recessed somewhat into the wall. The biggest problems with solar heat gain and the glare which direct sun entry can produce are experienced with east- and west-facing windows. In the middle of the morning and afternoon the sun can be low enough in the sky that only a very wide overhang can be effective. In such cases it is best to block the sun outside, before it reaches the glass, using tress, awnings, shutters, or other shading methods. Another alternative, illustrated in the drawing below, is to reduce the glazed areas in the building facing the east and west directions and/or to place unoccupied or non air conditioned spaces on the east and west sides of the building, to serve as buffering or insulating zones. 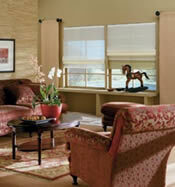 There are both interior and exterior shade options which can be used to protect windows not otherwise shaded from the sun. In general it is best to block the sun before it reaches the window. 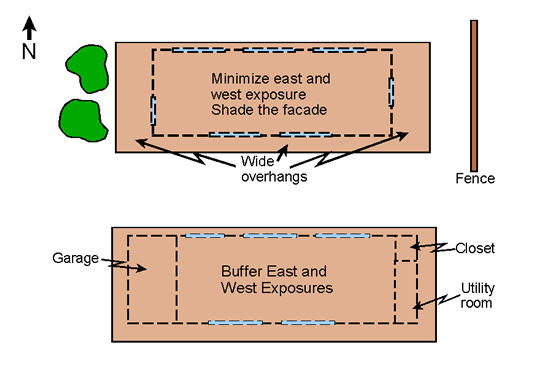 The variety of shading strategies shown below is effective at accomplishing that goal. Exterior shades catch the sun and reflect some of it away from the window. Some exterior shades are partially transparent, so some of the incident radiation passes through them to the window. The rest is absorbed by the shade material. 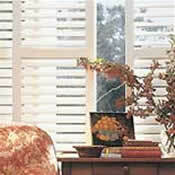 Heat absorbed by the exterior shade is largely carried away from the window by radiation and air borne convection currents. 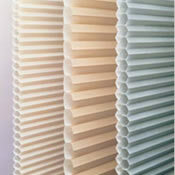 Some exterior shades are operable, meaning that they can be raised and lowered, or otherwise altered in their coverage and degree of protection of the window. 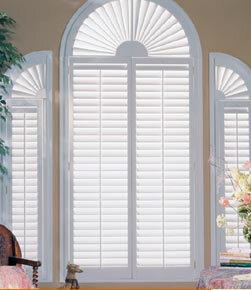 For otherwise unshaded east-facing windows, operable shades are a real advantage, because they can be lowered in the morning when the sun is rising, yet raised when the sun is on the other side of the building, thereby affording unobstructed views to the east. The same is true of west-facing windows in the afternoon. 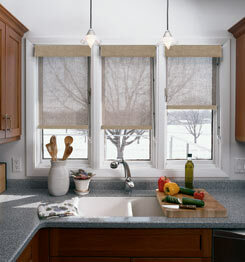 Some exterior shades serve a secondary window protection function. They can be lowered to fully cover the window and protect it from wind-blown debris or other consequences of adverse weather. 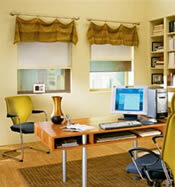 Interior shades can also be effective, in some situations. They need to be brightly reflecting toward the outside, so that solar radiation admitted through the glass is reflected by the shade back out through the window. Thus little of the sun's radiant heat can remain inside the building. 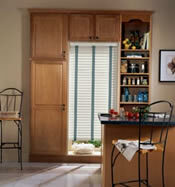 Draperies, Venetian blinds, vertical blinds, roll up shades, and a variety of other interior attachments are common additions to residential windows. They are used more for aesthetics and privacy than for solar heat gain prevention, but they can be effective heat blockers just the same. The key to success in this function is their solar reflectance on the window-facing side. The higher this reflectance the greater the quantity of solar radiation entering the window that can be reflected back through that window to the outside. You can have any color and pattern you want for the room-side of the shade, but it should be quite bright on the other side. White or near-white is best. Also, interior shades are more effective at reflecting solar radiation if the glazing system they cover is highly transparent, but they will reflect whatever beam radiation they receive back toward the window. Some of that radiation will transmit through the window and therefore not enter the room as heat gain. 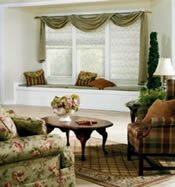 There is much variety to the kinds of interior shades, as seen in the illustrations provided here. They range from the simple pull-down roller shade to sophisticated dual shade systems composed of both blackout and translucent shades used in tandem. 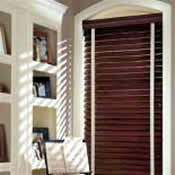 An important advantage of interior shades is that they are operable. They can be opened or closed or partially open, to suit your needs and the degree of solar radiation incident on the window. 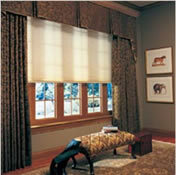 With west-facing windows, for example, you can have your shades wide open for maximal view and daylight illumination in the morning, when the sun is on the East side of the building, and close them in the afternoon when the sun shines strongly on the window during the hottest part of the day. If you are not installing new windows, or replacing old ones, and your interior shades are inadequate, you may like to consider adding applied window films. 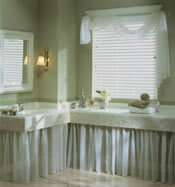 For more on this topic, see our web page on Window Films.